My family has an old photo of two women cooking. In the grainy picture from Taiwan, only the women’s hands are showing. 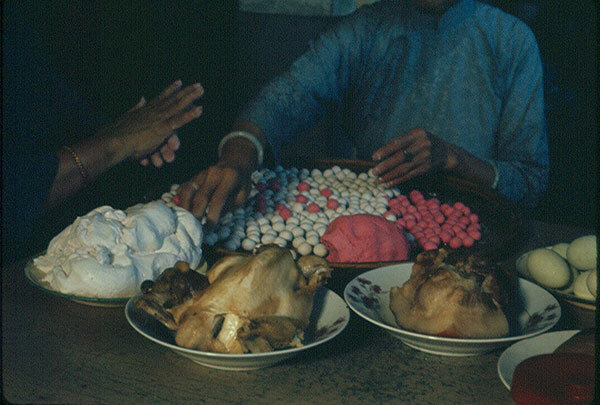 What you mainly see is a table full of food: two whole chickens, some eggs, two mounds of dough, and a huge tray of pink and white dumplings. I recently asked my father about this image. The woman on the left, in a dark dress, is my paternal great-grandmother. The woman on the right, in the light blue dress, is a great-aunt. Even without their faces, the photo shows so much about their interactions. 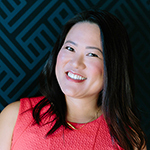 Their bodies are turned to one another, probably chatting, as their hands are busy pinching off bits of dough and rolling them into small rice dumplings. What’s the occasion? I’m not exactly sure. My father thinks it may be the Winter Solstice (dongzi), or it may be the Lantern Festival, which is celebrated on the 15th day after the Lunar New Year. The dumplings they are rolling, called in-a in Taiwanese, would be traditionally eaten during one of those two holidays. Although the dumplings are also eaten during non-holiday times as well, the two chickens indicate that this was a special event. In my childhood, my mother often had a pot of sweet red bean soup of the stove. In Taiwanese, this soup is called ang-tau-thng. The kind of beans used in this dish, and many Asian desserts, are not gigantic kidney beans or even the medium sized red beans of Southern cooking. 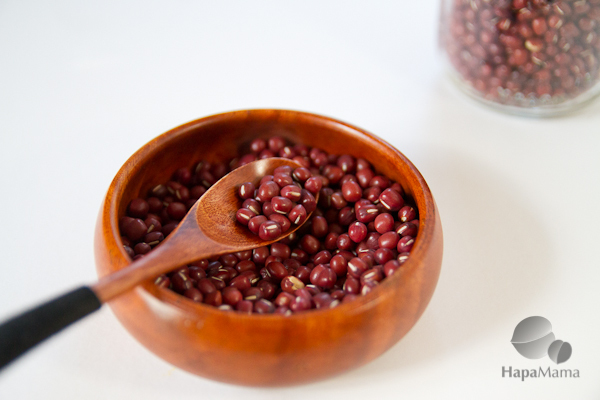 These are tiny azuki beans, that don’t seem to have the dry, starchy texture of larger legumes. 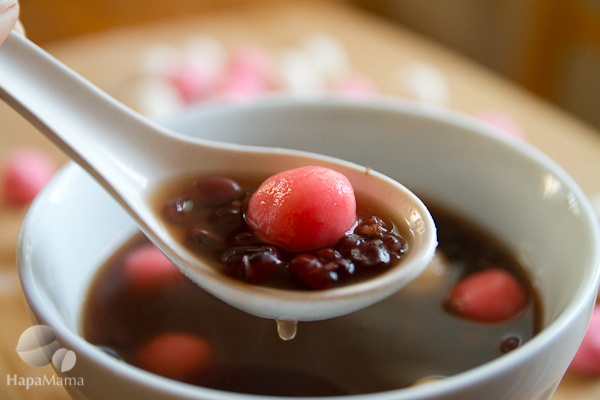 Red beans are considered a “warming” food in Chinese medicine, so they are often served during the winter. Green mung beans, on the other hand, are considered a “cooling” food, and often served over shaved ice during the summer. 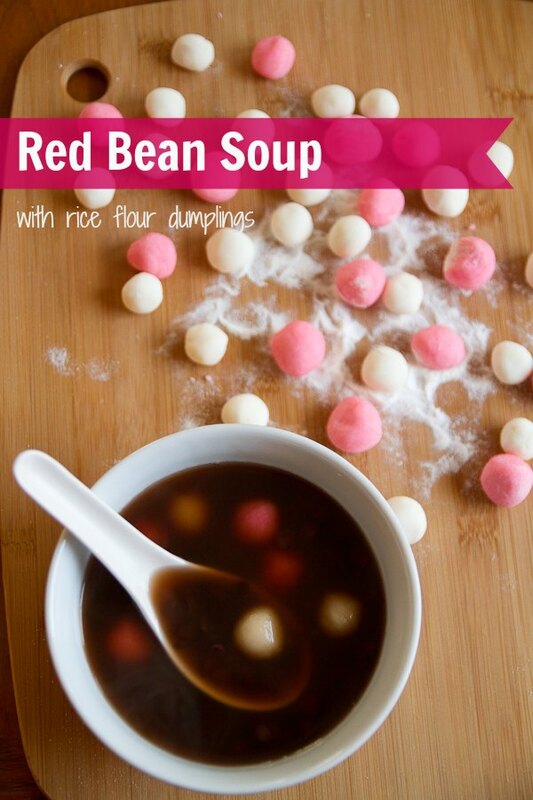 My mother always also had a little white box of rice flour in the pantry, which she would use to make the chewy dumplings that float in this soup. Premade dumplings can now be bought in the freezer aisle of an Asian grocery store, but they are so easy to make. It takes just a few minutes to stir the dough together, and even little kids can help roll it into balls. I certainly remember doing so as a child. Soak beans in water at least six hours or overnight. Bring to a boil, then reduce to simmer. Add rock sugar. Cook about 1 hour, or until beans are soft but not falling apart. 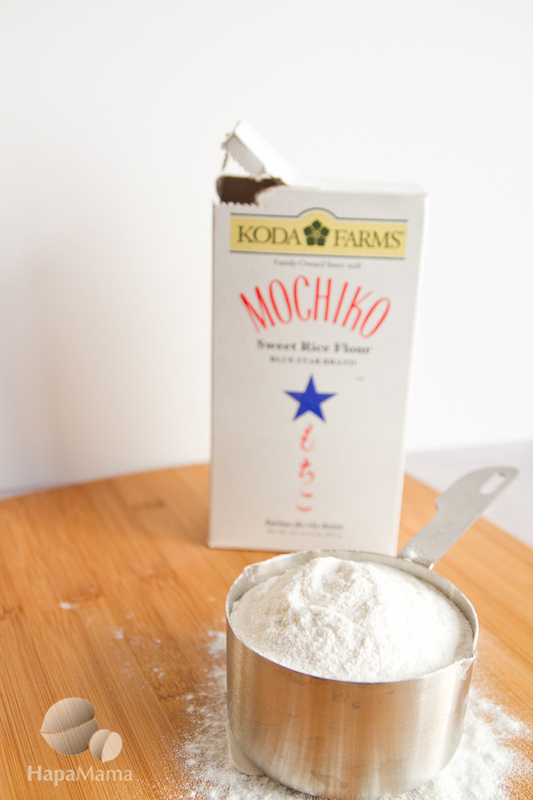 Meanwhile, mix 1/2 c. of sweet rice flour with 1/4 c. hot water, stir until a crumbs form, and then knead until it becomes dough. It will be very sticky, so try to do this by gently pushing the crumbs to form a mass and then pushing the drier parts into the stickier areas. Roll the dough into a 1/2″ cylinder, and then break off marble-sized chunks and roll them with your hands into balls. Set the finished dumplings aside on a lightly floured plate and cover with plastic wrap. Repeat the steps above to make the pink dough, adding a few drops of red food coloring to the reserved 1/4 c. hot water and mix with the remaining rice flour. Mixing the food coloring and water helps ensure an even pink tint, and not a spotty, marbled dough. When you are almost ready to serve the soup, bring it close to boiling again, then drop the dumplings in. You may want to add a little more water, if it has evaporated during cooking. Simmer for a few more minutes, or until the dumplings rise to the top. Spoon into individual bowls and serve. Yay! Tell me how to turns out. This is the ultimate cold weather comfort food. I’m not familiar with red rice dumplings. But yes, the red bean dessert soup. Actually nice to have a small bowl. Have you featured seaweed soup? Enjoy great Chinese New Year’s with your family. I’ll be celebrating both my birthday and CNY this year. Thanks, Pat! I only wish we had more old family photos like this. yummy…i remember my mom making this soup too! I love this soup. My family makes without the rice dumplings. I love the old pictures. It’s amazing how a single picture without clear faces can tell such a story. Yum! Great recipe! 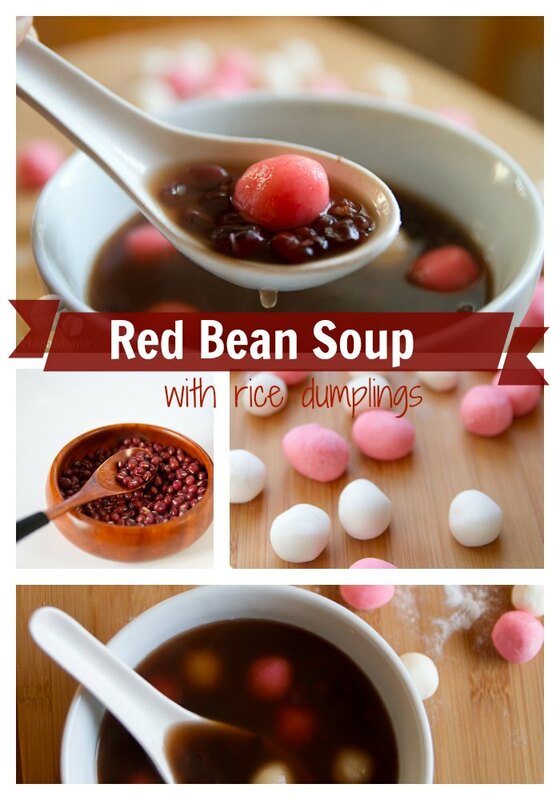 We love the red bean soup and the rice balls with sesame filling. I love these traditional foods, they remind me of my childhood. My mom makes this dish wonderfully!